I wear mainly bracelets and rings...usually big silver cuffs or tennis bracelets. I like big carat stone rings. Necklace wise, I wear big styles...Nefertiti style. Love big silver pieces and I’m a huge lover of everything Native American so the totem animals and the spiritual symbolism mean a lot to me. Sarah was born and bred in Edinburgh, Scotland, where her Mum, Dad and big Sister still reside. Losing her brother at a young age taught Sarah to grab life with both hands, so at the age of 18 she threw some clothes in a backpack and set off around the World on an adventure for 6 months. She then worked a couple summers in Rhode Island as a Horse Riding Instructor for kids age 6-17 before going to university. Travel has always been a big passion and now she finds herself living in the USA. Sarah trained at Rose Bruford College of Speech and Drama, one of the top drama schools in London where she gained a BA (Hons) in Acting. She began her presenting career at the age of 15 with Edinburgh’s leading radio station Forth FM. She has performed on London’s comedy circuit, presented and fronted numerous corporate projects for various clients and co-presented a live magazine show. Alongside her presenting Sarah is a voice over artist and has worked for many clients in the UK, including the BBC. She can also be spotted, working for MI6 with James Bond, in Skyfall. Sarah started her Shopping TV career in 2009 with Rocks & Co, London. This is where she first met, and was trained by Tony Diniz, one of Brazil’s leading Gem Hunters. She was headhunted by Gems TV, UK and then moved to TJC, London. Sarah transferred from TJC, the UK sister channel, to Shop LC in 2012 and has never looked back. Today she finds herself full circle, working with Tony again on air at Shop LC! She loves making buying informative and entertaining at the same time…never a dull moment. Sarah is AJP Certified through the GIA. In her spare time, Sarah works with animal rescue groups in Austin, mainly to reunite Lost and Found Pets. Animals have always been a love of Sarah’s, from helping out on her aunt’s farm during lambing season to taking in waifs and strays. She has a rescue dog from Austin, and her two cats she brought over from the UK. Sarah has ridden horses since the age of six and horses are a major passion of hers. Since back surgery in 2014, Sarah has been strength training and works out frequently. She also loves anything with an engine and has held her motorcycle license since the age of 16. These days she’s more likely to be found jet-skiing on the lake than tearing up the streets though! For more Zen like moments Sarah swaps the engine for a paddleboard instead. Meditation is also an integral part of her day. Sarah loves her family at Shop LC and has never felt more at home with a company, nor enjoyed a job more. 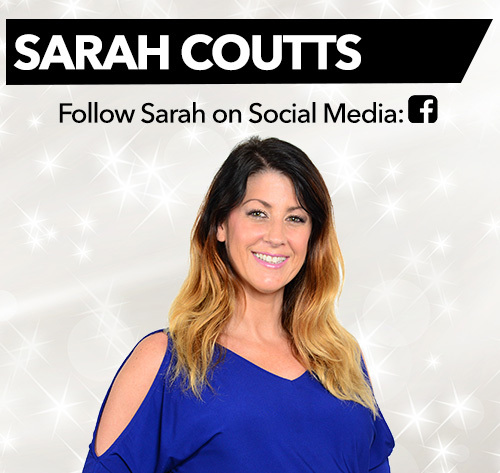 If you’d like to connect with Sarah you can like and follow her on Facebook at Sarah Coutts – Shop LC Host.